Named by Mormon pioneers, Zion means the ‘promised land’ which indeed is a perfect way to describe this peaceful yet dramatic landscape. Soaring red rock towers, massive monoliths and deep canyons are the hallmark of this park. 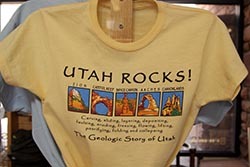 It’s Utah’s oldest and most visited outdoor attraction. For very valid reasons! 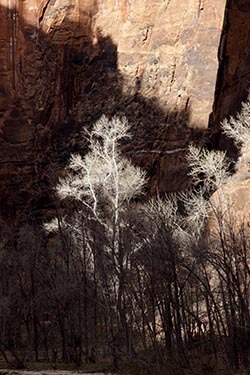 Everything in Zion takes life from the Virgin River’s scarce desert waters. Water flows, and solid rock melts into cliffs and towers. 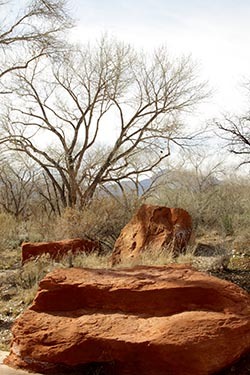 Landscape changes as canyons deepen to create forested highlands and lowland deserts. A ribbon of green marks the river’s course as diverse plants and animals take shelter and thrive in this canyon oasis. Park’s elevation range from 3,600 to 8,700 feet and provide vastly different environment. Fir, ponderosa pine and aspen prefer the heights whilst pinon, cliffrose and mesquite flourish in the desert heat below. After enjoying our breakfast at Leany’s at Grand Lodge in Brian Head, we departed for Zion National Park. En route highway 15 we made de tour to Kolab Canyons (part of Zion National Park). We drove all the way up to the view point that offered great views of Hurricane and Smith Mesa. 30 minutes well spent. We reached Zion Canyon Visitor Center at 12 noon. Since lunch was scheduled at 1PM, we had an hour to spend at the centre. I certainly recommend all visitors to the park to walk within and around the centre. It’s an excellent facility with exhibits and films that orients the visitors. Their gift shop is likely to engross everybody. At 1PM we were at Oscar’s Café in Springdale. The sun was out encouraging us to have our lunch out in the open. The café serves good food with Mexican influence. At 2PM we began our exploration of Zion. We had time till 6PM. By no means can 4 hours justify the visit. But, well our schedule was cast in stone! We drove on the Zion Canyon Scenic Drive all the way up to Temple of Sinawava. On the way we made stops that offered great views of The Sentinel, Court of the Patriarchs, Angels Landing, Weeping Rock and the Great White Throne. We parked our van at the Temple of Sinawava and took the mile-long Riverside Walk. As the name suggests, the walk (an easy one) is along the river with the Mountain of Mystery soaring on the banks. 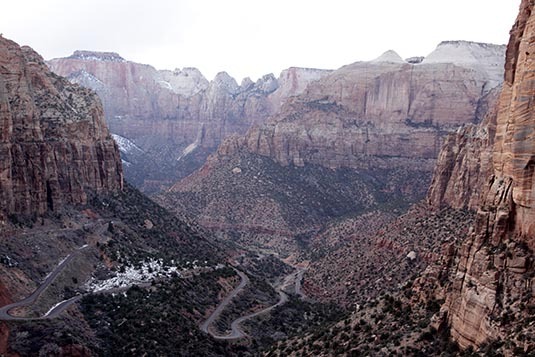 Zion National Park has many trails – easy and hard. The most famed and really hard is the trail to Angel’s Landing. The hike would take at least a day. Since time and energy was scarce we were advised (and quite rightfully) to take the Canyon Overlook Trail that begins just as the Tunnel ends. 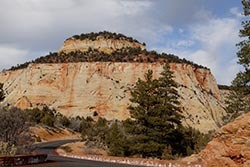 We took the Zion – Mount Carmel Highway and drove all the way up to Checkerboard Mesa that stands 6,670 feet tall. Over centuries, erosion created interesting patterns on the mesa that truly resembles a checkerboard. On our way back, we parked near the Tunnel and commenced our hike on the Canyon Overlook Trail. Little did we know that it was a pretty tough (by my standards) trek. At times the narrow passage was just inches away from steep and straight drops. However, the pain was all gone when we reached the final viewpoint. The panoramic view was just outstanding. I am told the view from here is as good as the one from Angel’s Landing. By 6:30 PM we were at Zion Lodge – our hotel for the night. Located bang in the centre of Zion, undoubtedly this would be the place to stay. Of course, you would need to plan your visit well in advance to be able to get a room especially in the summer months. Zion Lodge offers great dining experience too. Tomorrow would be our last day of the fascinating trip that we had in Utah. After breakfast at the Zion Lodge, we left for a brief visit to St. George – named by National Geographic as one of the 50 best places to live and play in the USA. At 9:30 AM we were at Snow Canyon Visitors Centre just at the outskirts of St. George town. Contrary to its name, winter visitors will rarely find any ‘white stuff’ at this 7,400 acre desert park. Named after Lorenzo and Erastus Snow, early Utah leaders, Snow Canyon offers 16 miles of hiking trails, rock climbing, horseback riding amongst other outdoor adventures. The park is home to sandstone cliffs in red and white as also peaks and valleys of jumbled black lava rock. We took a shot hike in park and made a brief visit to Entrada – a gated facility, designed on Spanish lines housing a hotel and a golf course just near the Snow Canyon Park. The lunch was organized at The Painted Pony in St. George. After a great burger meal, I took the shuttle from St George to Las Vegas to catch my flight back home. The 150 mile journey was covered in just less than 2 hours. No wonder, Zion National Park is quite popular with visitors to Las Vegas. I was at Las Vegas International airport at 3PM. Good to know that there’s a time change of an hour – you need to set your watch backwards.